Concious the role of R&D in the evolution of market competitive hybrids and other agribusiness products, the company has continued to invest heavily in R&D to augment research facilities, farm infrastructure development, and mechanization of farm operations and in human resource deployment. Such thoughtful efforts of the past are now contributing to the consolidation and sustainability of gains. The company has extended cropped area and diversified crops by adding newer ones for agri-seed business. Red gram, onion, mustard and wheat are the additions to the crop cafeteria of the company.. Furthermore, the company has successfully launched several new hybrids of sunflower, cotton and bajra in the market The product folio is also expanded for maize, rice and vegetable crops inclusive of both-hybrids and OPVs. As our agriculture is at the mercy of monsoon, to save the precious water company installed drip system in its farms at Gowrarum, Bejjanki and Gatla Narsingapur. Field labs to enhance working efficiency of technical and scientific staff. Mechanization to surmount labor shortage. 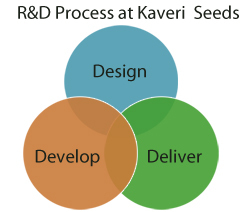 At Kaveri the investment made in Biotechnology has started paying off in terms of accelerating the breeding programmes of cotton and rice. DNA profiling of our lines, use of DNA markers in genetic purity assessment and tracking the gene of interest in breeding material are some of the activities undertaken for gainful deployment of biotechnology tools in product development. In order to retain the proprietary rights on varieties, hybrids and parental lines developed by our R&D, efforts are afoot to register ~ 100 lines and hybrids owned by the company with PVP&FA till date. (i) Crop biotechnology (ii) Bio pesticides and Biofertilizers. The Biotech programme envisages to introgress the transgenes into parental lines for hybrid production. The on going programme involves i)Introgression of BT gene (Bollgard incorporation in to parental lines of cotton ii) stacking two BT genes (Bollgard II) in to parental lines of cotton and develop BT cotton hybrids. The marker based DNA technology is helping in fast track development of lines through back cross breeding. Through the conjunct use of biotechnology and hybrid technology is the way forward for evolution of new generation Kaveri hybrids.